Online job descriptions are one of the few Web pages whose primary design has not changed since they first appeared on Online Career Center, Monster and DICE in the early ’90s. Job descriptions continue to look like little more than old print help-wanted ads pasted online. What happens to candidate engagement when you add a modern day component like video to a job description? Note: see Yelp Account Execuitive for an example of video job descriptions. 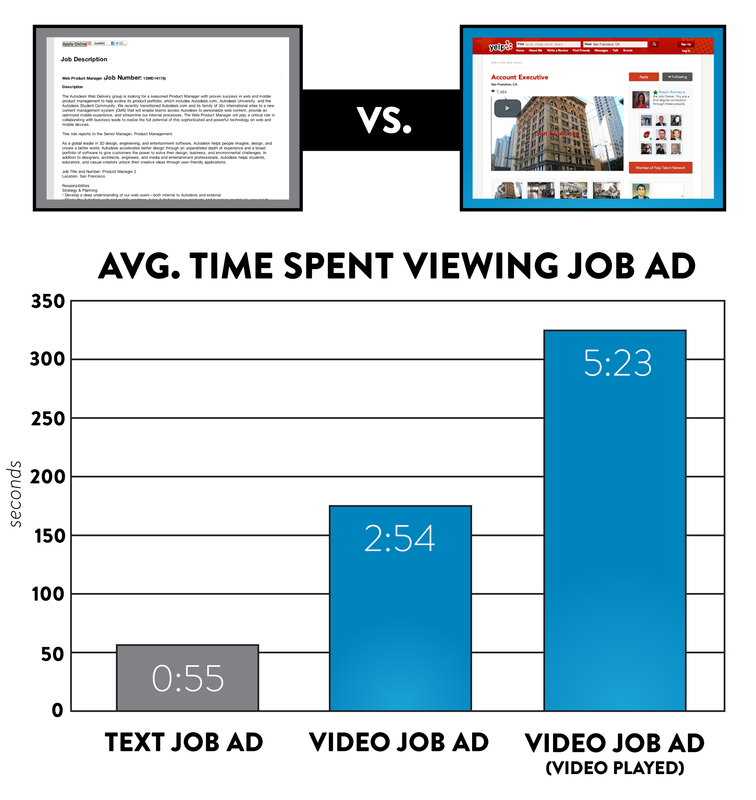 Our data shows that candidates spent more than triple (316%) the time on a video job description (2 min. & 54 seconds) than they did on a text job description (55 seconds). How’s that for driving candidate engagement? We used 2 resources for this: 1) We asked this question on Quora, “What is the average time on page for a job description?“, and the best answer we got back was 55 seconds from Owain Wood who kindly looked at data from 450 job description from his SAP job board. This 55 second data point was further backed up by the data from a second source, TheLadders, that ran data for the Wall Street Journal showing a range of 49.7 seconds (candidates not interested in the job ad) to 76.7 seconds (interested candidates) as reported by the Wall Street Journal in How We Really Read Job Ads). We used data from video job descriptions powered by Ongig from employers such as American Express, Yelp and blinkx. We looked at video job descriptions from Ongig clients and measured the Session Time from just the ones in which a user played the video. We used Session Time instead of Time on Page for this because Google Analytics would not provide Time on Page for an Event like video play — Session Time was the next best measurement. You might be wondering, “It’s great that video boosts a job description’s quality, but how do I scale video or pictures across all my job descriptions?” Great question. We’ll cover that in a future post.